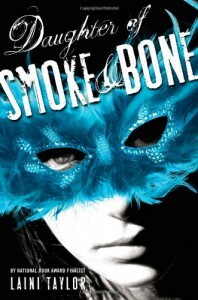 Daughter of Smoke & Bone - Jess Loves to Read! This book really surprised me...I'm usually not into so much fantasy, angels and monsters and magic and such...but I am in love with these books! I sped through the first two and am reading the third now. I was curious because of all the great reviews, and I was very pleasantly surprised at how much I liked this book! The character development is great! The book is very well-written! This book got me hooked and I couldn't stop until I figured out what happened at the end of the third book! I love Karou! Too many YA books stAAar the heroine who is love-struck and spends half the book having a pity party about how she cannot be with her love...even is she just met the guy a couple of weeks (sometimes even days before), it's always "instalove" and she can do nothing without him. Karou is independent, smart and can do anything without a boy to back her up! I love Zuzana! She is exactly what Karou needs to keep her connected to the human world. I cannot get over how good this book was! I read this one in a day, and only waited until the next day to start the next book, because my bf decided that I needed him to be the voice of reason and remind me that I needed to get some sleep if I was going to go to work the next day. Those are the books I love...the ones that get me so enthralled that I must be reminded to perform necessary human functions, such as sleeping or eating. LOL I'm glad that my bf is willing to be the voice of reason when I need to sleep or bring me food if I will not put my book down.